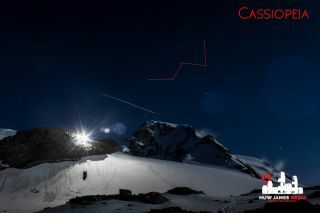 The big W of Cassiopeia, marked in red, shines bright over an alpine hut, high in the Italian mountains, with the International Space Station (seen as a light streak) making a flyby. In the darkness of the Italian Alps, the Rifugio Gnifetti shelter shines bright, offering refuge to mountaineers. High on the Garstelet Glacier, more than 11,800 feet (3,600 meters) above sea level, it's a welcoming site to travelers in the cold, unforgiving surroundings of the alpine mountains. En route to higher huts and greater peaks, I spent an evening outside the refuge imaging a full moon, with the Aosta Valley below, Turin and Milan in the distance, the International Space Station soaring above, and the great asterism of the big W, the constellation of Cassiopeia, in the sky. The star lore of Cassiopeia has always captivated me: A queen of Aethiopia boasting of her beauty, and that of her daughter, ropes in five other constellations to her story. As the tale goes, Cassiopeia — in a hubristic, vain gesture — announced she and her daughter were more beautiful than the Nereids, the nymphs of the sea. In anger, the sea-god Poseidon sends the sea-monster Cetus to attack the city that Cassiopeia and her husband King Cepheus rule with their daughter, Andromeda. The Oracle of Ammon later tells Cepheus that the king can save his city by sacrificing his daughter. Cepheus does so by chaining Andromeda to the rocks just off the shore of the city. By coincidence, legend has it, Perseus passes by atop his winged horse Pegasus while returning from slaying the gorgon Medusa. He swoops down and makes a deal that he will save Andromeda in return for her hand in marriage. Cassiopeia and Cepheus agree, and Perseus uses the head of Medusa to turn Cetus to stone and the sea monster sinks to the bottom of the ocean. Thinking Cassiopeia has not suffered enough, Poseidon casts her into the stars, very close to the North Star, Polaris. Each night, Cassiopeia's tight, circumpolar orbit means that she, shackled to her chair, "plunges like a diver, parted at the knees," said Aratus of Soli in "Phaenomena" around 300 B.C. Despite her checkered past, Cassiopeia as a constellation holds a wealth of treasures. A great road sign to navigate your way around the night sky, the pattern hosts many hidden wonders. Taking pride of place within the eye line of the Milky Way from where observers view her, Cassiopeia is in one of the richest portions of the night sky, one that contains a plethora of deep-sky objects. Many objects from the Messier and NGC star catalogs lie within the boundaries of the constellation, most as star clusters. The best of these clusters, visible in larger binoculars or a small scope, is M52. With 200 stars tightly packed and an age of only around 35 million years, it makes for a great introduction to Messier clusters. Other deep-sky objects to note are M103, NGC 7789 and the Owl Cluster, NGC 457. This is an open star cluster that resembles the bird, with two beady eyes located around the star Phi Cassiopeiae. M103 and NGC 7789 are both open star clusters, groups of stars clustered together ranging from just 40 relatively young stars in M103 to nearly innumerable older stars in NGC7789. For Radio Astronomers, Cassiopeia contains Cassiopeia A, an extremely bright extrasolar radio source, the remnants of a supernova. There is a meteor shower that takes its name from Cassiopeia, but it's a poor one. The more spectacular neighboring Perseids, however, stray into the constellation in August each year.